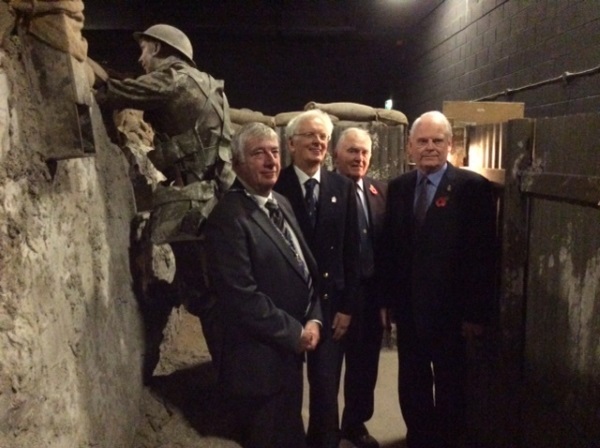 Members and Friends of the Rotary Club of Bangor gathered at the Somme Centre in Conlig on Wednesday 12 November 2014 to remember those who have fallen in wars across the past century. Led by President Ian Wilson and with contributions from Past President Bill Aiken and Rotarian Luigi Rossetti, the short service of remembrance was given additional poignancy with the Last Post and Reveille played by Rotarian and Bugler Brian Hall. Local historian Bob McKinley took members back to pre-1914 with a story about a fear of German spies using the Lead Mines at Conlig as their headquarters in advance of the imminent invasion. After lunch many Members took the opportunity to visit the Somme Centre Exhibitions.